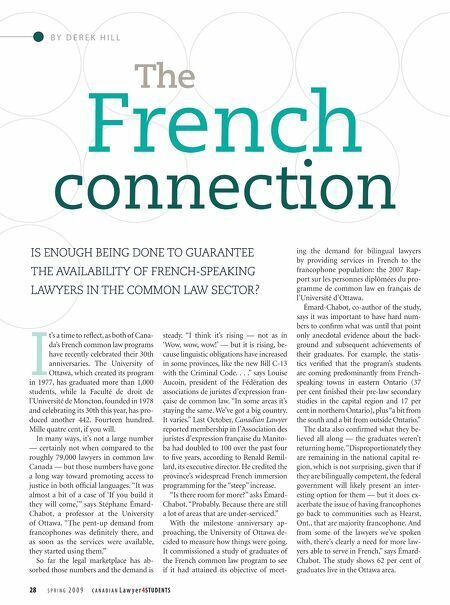 BY DEREK HILL FrenchThe connection IS ENOUGH BEING DONE TO GUARANTEE THE AVAILABILITY OF FRENCH-SPEAKING LAWYERS IN THE COMMON LAW SECTOR? in 1977, has graduated more than 1,000 students, while la Faculté de droit de l'Université de Moncton, founded in 1978 and celebrating its 30th this year, has pro- duced another 442. Fourteen hundred. Mille quatre cent, if you will. In many ways, it's not a large number I 28 — certainly not when compared to the roughly 79,000 lawyers in common law Canada — but those numbers have gone a long way toward promoting access to justice in both offi cial languages. "It was almost a bit of a case of 'If you build it they will come,'" says Stéphane Émard- Chabot, a professor at the University of Ottawa. "The pent-up demand from francophones was defi nitely there, and as soon as the services were available, they started using them." So far the legal marketplace has ab- sorbed those numbers and the demand is SPRING 2009 t's a time to refl ect, as both of Cana- da's French common law programs have recently celebrated their 30th anniversaries. The University of Ottawa, which created its program steady. "I think it's rising — not as in 'Wow, wow, wow!' — but it is rising, be- cause linguistic obligations have increased in some provinces, like the new Bill C-13 with the Criminal Code. . . ." says Louise Aucoin, president of the Fédération des associations de juristes d'expression fran- çaise de common law. "In some areas it's staying the same. We've got a big country. It varies." 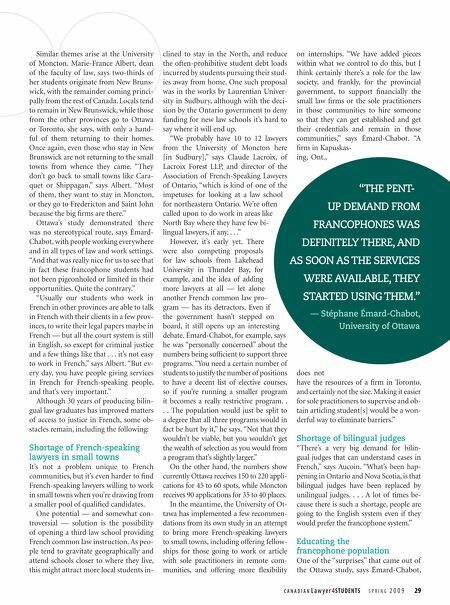 Last October, Canadian Lawyer reported membership in l'Association des juristes d'expression française du Manito- ba had doubled to 100 over the past four to fi ve years, according to Renald Remil- lard, its executive director. He credited the province's widespread French immersion programming for the "steep" increase. "Is there room for more?" asks Émard- Chabot. "Probably. Because there are still a lot of areas that are under-serviced." With the milestone anniversary ap- proaching, the University of Ottawa de- cided to measure how things were going. It commissioned a study of graduates of the French common law program to see if it had attained its objective of meet- 4STUDENTS ing the demand for bilingual lawyers by providing services in French to the francophone population: the 2007 Rap- port sur les personnes diplômées du pro- gramme de common law en français de l'Université d'Ottawa. Émard-Chabot, co-author of the study, says it was important to have hard num- bers to confi rm what was until that point only anecdotal evidence about the back- ground and subsequent achievements of their graduates. For example, the statis- tics verifi ed that the program's students are coming predominantly from French- speaking towns in eastern Ontario (37 per cent fi nished their pre-law secondary studies in the capital region and 17 per cent in northern Ontario), plus "a bit from the south and a bit from outside Ontario." The data also confi rmed what they be- lieved all along — the graduates weren't returning home. "Disproportionately they are remaining in the national capital re- gion, which is not surprising, given that if they are bilingually competent, the federal government will likely present an inter- esting option for them — but it does ex- acerbate the issue of having francophones go back to communities such as Hearst, Ont., that are majority francophone. And from some of the lawyers we've spoken with, there's clearly a need for more law- yers able to serve in French," says Émard- Chabot. The study shows 62 per cent of graduates live in the Ottawa area.